Its day 4 of the Brock Yates One Lap of America, and the band of One Lappers are at Daytona for two time trial events today. Coming into today, TSM Leh Keen and Douglas Wilks are at the top of the leader board. Check out some in car video of Leh Keen at Litte Talladega from this Sunday. Man he can hustle this car. Watch his hands catch it as it steps out. Daytona #1. A little bit of drama for the TSM team. 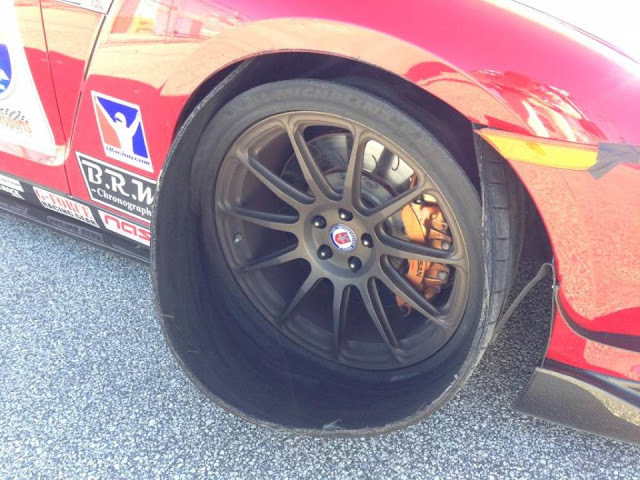 At 130 mph during the warm up lap the car lost a right front tire. Since it happened before the timed laps started, they were able to borrow a tire, take a 10 second penalty and still finish in 3rd. GT-R's in 1,2,3,4,6,and 9 of the top ten. Not too bad. You don't want this happening at 130 mph. 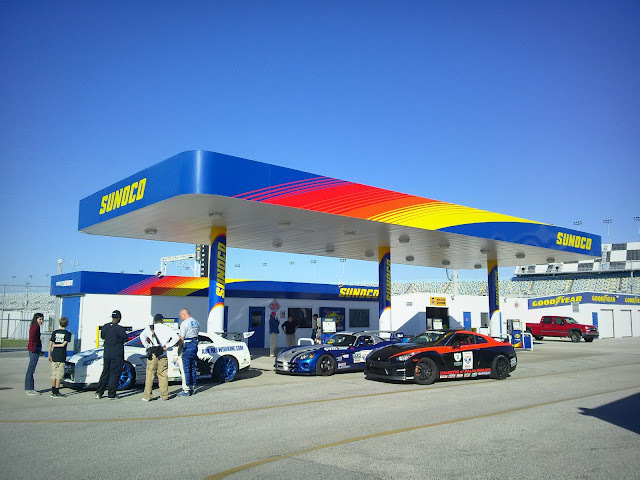 TopSpeed Motorsports blog. “Hey guys. We did blow a tire but borrowed one and will be able to still run the first session. With a 10 second penalty though. We aren’t exactly sure why the tire blew and will likely never know because it really destroyed the underside of the fender. It went at around 130mph in nascar T4 on my warm up lap… It is very common to have tires blow on the banking as it is an extreme case scenario with loads and such. Hugh from Chariots of Palm Beach is loaning us his tire for the day then we will get a new tire put on our wheel for the rest of the event. We can not thank him enough!!!!! Although this is pretty cool too. Out of 51 cars still running. Which means the minivan beat quiet a few Corvettes, Camaros, Mustang's and Mercedes. Overall standings after day 4. GT-R's at 1,3,4,5,6, and 10. Three events tomorrow. First two at Carolina Motorsports Park, then to the BMW Performance Center.